I am starting this post to share a daily computer (PC) tips to keep your PC clean,Organize your embroidery designs properly and so on....I will modified this post daily and will share a daily computer tips over here.You can replied to this post if you want to share your tips or gratitude. 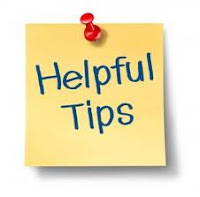 1) Always create a shortcut of your files rather than copying your files to different folder, it will help you to save your space and even there will not be duplication of embroidery designs on your laptop or pc. 3) Try to keep your Desktop neat and clean. 4) Make sure your anti virus software is updated. 5) If you are getting "EVERY TIME" SSL certificate and prompt to add site to exceptional rules,then please check the date of your computer.This may happen because of incorrect date and time on pc. 6) Avoid Garnishing your PC, keep it simple look and display.This is because high definition look and display consume more power and RAM and there by slow down your PC. 7) If you are using Internet, then download "CC Cleaner" to remove the temporary files on your PC and remove the files at a certain interval. 8 ) Lost your files on your PC, no problem, there are some IT tools that can recover your data 100%example: "EASUS DATA RECOVERY". 9) It is very easy to make the USB Drive appear to be a bigger, a 2GB pen drive can be manipulated to be shown as a 4GB by using some coding.So take a note of it. 11) Use "Deep Freeze" software to freeze the certain drives of your PC,specially the main drive.It is software that can be installed on your pc and selected drive would be freeze, that is nothing can be added or can removed from PC.You may freeze your main drive to protect from virus.It require to disable the deep freeze options in case you want to add something.Generally, it is used for the PC which by everyone or public. 12)Remove the unwanted software from your PC, this will speed up your PC. 16) Do not put any thing that use a magnet in front of the monitor. Placing a magent in front of the Monitor screen will harm the display screen of your PC and soon your monitor screen will not work at all. 17) Never save your password unless it is required.Further, if you required to save the password then use the following firefox plugin to save the password in fire fox. You can also find a alternate plugin for the other Browser. 18) Always Shut down your PC properly for long life of the computer. 19) Never left your PC with out installing any Antivirus or internet Security.You can atleast afford a Free Antivirus or Internet Security.Find list of free Antivirus over here.20) Disable all background effect options.Keep your PC as simple as possible. This will increase the speed of your PC. Did you have any Questions, problem related to your PC or Computer then do share in this category.I will try to help you out to solve your Problems.Computer is my Hobby and i would be happy to help you out. To avoid any confusion, please do not share in this topic.Create a new topic for your queries.